The Gulf Coast Kiln Walk Society (GCKWS) is proud to host master ceramic artist Masayoshi Shimizu from Japan in January and February of 2019. For more information about Mr. Shimizu and his visit and schedule of activities, please click this link. 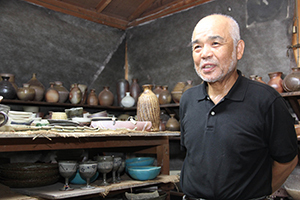 Mr. Shimizu will conduct and participate in activities at the Gulf Coast Kiln Walk site in Holley Navarre. The Anagama kiln is the largest in the state of Florida, and the Ralph Howard Phillips Southern Groundhog kiln is the only 1940‘s era wood-fueled kiln in the state. On February 9th, 2019, GCKWS, with Mr. Shimizu, will host the Woodstoke Festival at Kiln Walk. It is free and open to the public. The two wood-firing kilns will be unloaded and the newly wood-fired pots will be on display as they are removed from the kilns. Some pots will be available to purchase and there will be food for all! Please plan to join us! For more information about the Woodstoke Festival, please click this link. To learn about the sponsors of Mr. Shimizu's visit, please click this link.